Is there anything more beautiful than an “A” in Algebra? Not to the Lial team! Marge Lial, John Hornsby, and Terry McGinnis write their textbooks and accompanying resources with one goal in mind: giving students and teachers all the tools they need to achieve success. With this revision of the Lial Developmental Algebra Series, the team has further refined the presentation and exercises throughout the text. They offer several exciting new resources for students and teachers that will provide extra help when needed, regardless of the learning environment (traditional, lab-based, hybrid, online)–new study skills activities in the text, and more. Marge Lial was always interested in math; it was her favorite subject in the first grade! Marge's intense desire to educate both her students and herself has inspired the writing of numerous best-selling textbooks. Marge, who received Bachelor's and Master's degrees from California State University at Sacramento, is affiliated with American River College. Marge is an avid reader and traveler. Her travel experiences often find their way into her books as applications, exercise sets, and feature sets. She is particularly interested in archeology. Trips to various digs and ruin sites have produced some fascinating problems for her textbooks involving such topics as the building of Mayan pyramids and the acoustics of ancient ball courts in the Yucatan. When John Hornsby enrolled as an undergraduate at Louisiana State University, he was uncertain whether he wanted to study mathematics education or journalism. His ultimate decision was to become a teacher, but after twenty-five years of teaching at the high school and university levels and fifteen years of writing mathematics textbooks, both of his goals have been realized. His love for both teaching and for mathematics is evident in his passion for working with students and fellow teachers as well. His specific professional interests are recreational mathematics, mathematics history, and incorporating graphing calculators into the curriculum. John's personal life is busy as he devotes time to his family (wife Gwen, and sons Chris, Jack, and Josh), and has been an avid baseball fan all of his life. John's other hobbies include numismatics (the study of coins) and record collecting. He loves the music of the 1960s and has an extensive collection of the recorded works of Frankie Valli and the Four Seasons. A native Midwesterner, Terry McGinnis received her Bachelor’s of Science in Elementary Education with a concentration in Mathematics from Iowa State University. She has taught elementary and middle school mathematics, and developed and implemented the curriculum used with her students. Terry has been involved in college mathematics publishing for over 20 years, working with a variety of authors on textbooks in both developmental mathematics and precalculus. 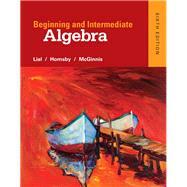 After working behind the scenes on many of the Lial/Hornsby textbooks and supplements for over 10 years, Terry joined Margaret Lial and John Hornsby in 2002 as coauthor of their developmental mathematics series that includes Introductory Algebra, Intermediate Algebra, and Introductory and Intermediate Algebra. When not working, Terry enjoys spinning at a local health club, walking, and reading fiction. She is the devoted mother of two sons, Andrew and Tyler.